This year is the 60th Anniversary of the end of the Second World War and throughout the country the Royal British Legion has been celebrating the event. In the last issue we focussed on Walkern men who played a part in the conflict and now it is the turn of the Walkern women, who also contributed to the final victory. Marjorie Ashurst has lived all her life in Walkern. Her father, Tom Boorman, kept the cycle shop in the village and was responsible for starting the local branch of the Legion, becoming its first treasurer. With war looming, many joined the Civil Defence training scheme, which included first aid and air raid precautions. As an 18-year-old, Marjorie was anxious to help and as war was declared she joined the Red Cross and was sent to Hitchin General Hospital for training. 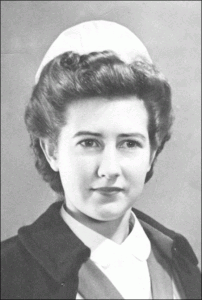 After gaining her nursing qualifications, Majorie undertook auxiliary work with the Civil Nursing Reserve before being called up for full-time service in 1940 and being posted to St Paul?s, Walden Bury, home of the Queen Mother and Bowes Lyon family, which had been converted into a convalesent home for servicemen. Over the next three-and-a-half years the hospital treated over 1000 patients from Dunkirk, Normandy, Arnhem and the advance to the Rhine. Thanks to American generosity, an Orthopaedic Unit was added, providing a much-needed facility for treating badly wounded patients. Despite their handicaps, the patients remained cheerful and a happy atmosphere existed throughout the war. The nurses joined in the fun, playing table tennis with the patients, organising whist drives and dances. The dances often proved a painful exercise for the nurses as the patients invariable had their feet covered in plaster and it was the girls who hobbled off the dance-floor afterwards! The servicemen who passed through Walden Bury never forgot their experiences and the mailbag was continuously full of letters of thanks. 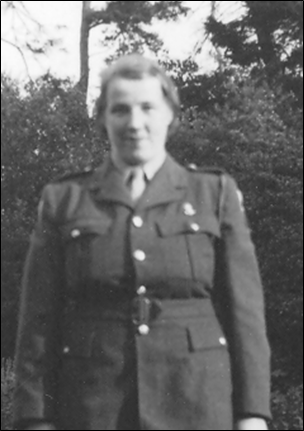 Towards the end of the war Marjorie married Jack Ashurst, an airman she had nursed after he was injured in a road accident. They lived the rest of their lives together in Walkern. Ardeley Bury employed a large household staff in order to entertain weekend guests on a lavish scale. 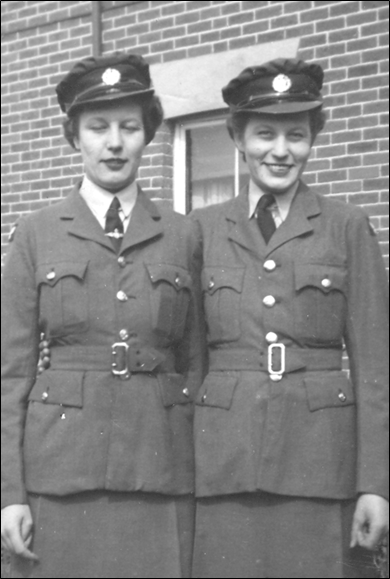 During the war, the house became a retreat for allied officers, particularly Americans and Canadians, and although Mrs Howard Carter delayed Rhona?s call-up for a year, she finally enlisted in the Auxiliary Territorial Service (ATS) in 1942. Posted to Northampton army camp for training, Rhona soon experienced military discipline when her hat blew off during drill practice. She stooped to pick it up, but was brought smartly to attention by the Sergeant Major. ?Leave it there!? he shouted. Further training followed when Rhona was sent to Edmonthersham House, a searchlight battery near Bristol, where the Americans were particularly friendly and after one riotous party threw Rhona backwards into a hedge! Things quietened down after that when she was posted to the Officers Mess at Blandford Drill Hall, where she served as a bat woman. A further spell at another officers mess, this time at Upway near Weymouth, culminated in her final posting to Chelsea in London where she was assigned to cleaning, with a few others it has to be said, the Albert Hall! As the war ended Rhona joined the NAAFI staff at their new headquarters in the King?s Road. She was demobbed in 1946 with the rank of Lance-Corporal. ?I made many friends in the Army and still keep in touch with three of them, Joan from Oxford, Doris from Cornwall and Gladys from London,? says Rhona. After the war Rhona worked at Walkern Hall until her retirement and for the past 80 years has lived with her sister, Nora, in the same cottage at Bassus Green. Betty Canning, who lives in Stevenage Road, and her twin-sister Dorothy lived at Ash near Canterbury when war was declared. 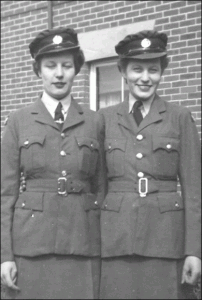 They joined the Women?s Auxiliary Air Force (WAAF) together in 1943 and were posted to Morcambe for their basic training. Betty recalls marching along the front one day when they were passed in the opposite direction by a squad of men, one of whom she recognised as a neighbour. ?Hello,? she exclaimed. ?Be quiet,? barked the drill sergeant, ?Don?t talk when you are on parade!? 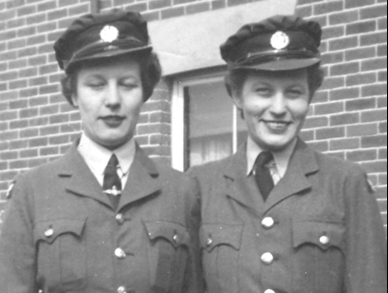 However, Betty?s naturally friendly personality stood her in good stead when she and Dot completed their training and were posted to RAF Tempsford near Sandy in Bedfordshire. Although they worked in the Officers Mess, they were unaware just how important Tempsford was to the war effort. In fact, it was the base for top secret operations flying allied agents into enemy occupied Denmark, Norway, Belgium, Holland and France. Among the famous agents who flew from the base was the French heroine, Violette Szabo. But the operations came at a price for the RAF pilots involved in these dangerous missions with more than 550 losing their lives. It was one of Betty?s jobs to check the names of those who would be eating in the mess each day and as pilot?s names were crossed from the list she feared the worst and felt very sad. There were funny sides too, however, and she remembers with affection an eccentric French Flight-Lieutenant, Philippe Livry-Level, who always insisted on egg and bacon before a flight out and the same again on his return. ?But he would not eat his meal if the egg was broken,? Betty recalls. The highlight of Betty?s time at Tempsford was a visit by King George VI and Queen Elizabeth in November 1943. They inspected the WAAF contingent and then came into the Officers Mess for a cup of tea. They were so nice and really lifted our spirits,? says Betty..When VE Day finally arrived the base went wild and we held a spontaneous dance in one of the hangers, although the concrete floor was a bit hard on the feet. But nobody cared and we felt so happy after all the sadness that had gone before,? Betty concludes. It was at Tempsford that Betty met her husband, Frank, whose family ran the Canning building firm in Walkern and it was to the village that she returned with Frank in 1948, where she has lived ever since. Betty regularly visits her sister, Dot, who still lives at Ash in Kent, and being an identical twin often causes the locals some confusion. Mavis Porritt, like many children living in London in 1939, was evacuated from the city at the outbreak of war. Along with her school friends she was sent to Linslade in Bedfordshire (later known as the scene of the Great Train Robbery). Leatherhead specially designated to treat air raid casualties from London. The hospital also looked after servicemen injured in the North Africa campaign and RAF personnel caught up in air battles over the Home Counties. Some, however, were casualties from skirmishes nearer to home, one of whom came into hospital in March 1944. ?I rather fancied him,? says Mavis, ?but Matron was very strict and would not allow King?s nurses on to the officers? wards so any romance was difficult.? In May the hospital was cleared of all but seriously ill patients as the wards were prepared to receive D-Day casualties. Troops came in to Leatherhead straight from the beachheads, so the nurses were kept very busy treating all three services, including the occasional German. 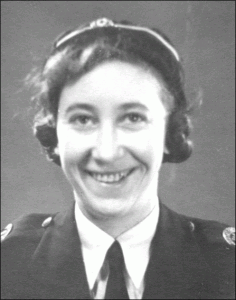 When her stint at Leatherhead came to an end, Mavis returned to King?s to handle casualties from the deadly V1 and V2 rockets. On VE night in 1945, Mavis and her mother joined the throngs pushing down The Mall towards Buckingham Palace hoping to see the King and Queen out on the balcony. ?As we got closer I noticed an ATS officer walking alongside me and with her a young girl, who was not in uniform. My mother and I exchanged glances as we realised it was Princess Elizabeth and her sister Margaret. With that a plain clothed officer asked us not to draw attention to them as they, like us, wanted to call for the King and Queen. Once our calls were answered the two princesses were quietly spirited away,? Mavis recalls. The Matron at Leatherhead could not suppress the course of true love and Mavis and Roy were married at St Mary Abbot?s Church, Kensington, in 1945, and this year they celebrate their Diamond Wedding. Hello, I’m looking for some sort of information on the Lumbis family , my father was born in walkern and meet my mother in the land army there. I know they where married in walkern church and my fathers name was William John Lumbis and my mothers maiden name was Murial cockrall . I lost contact with my family many years ago . But as a child I can remember seeing a news paper clipping of my mum driving a very large tractor through st Alburns high st in her land army outfit. I know it’s a lot to ask but do you have any information on the Lumbis family .